Is photography taking over from the barbed hook? With the advent of the digital age it seems almost incumbent on us as anglers to have photographs of our fish. The ol’ “grip and grin image” is near mandatory and doubly so should one claim capture of a trophy specimen. Now people head to the river with waterproof cameras, cell phones and on one occasion I had a client whip out an Apple iPad right there in the middle of the stream, I am glad I wasn’t insuring the darned thing I can tell you that. Electronics and H2O don’t generally make happy bedfellows and I have drowned a few cameras and cell phones in my time. Trouble is that it appears with the digital age, people won’t just take your word for it, it is almost expected that you should have a photo of your catch and expected that you then spread it about a variety of social media. If you don’t have a picture you can see people’s eyes glaze over a fraction and the doubt that your fish really was 20” is written all over their features. A few specimens are gaining near celebrity status on the world wide web and what with YouTube, Facebook, eMails and such it has reached the point that one can hardly be taken seriously unless you have a photo of your fish plastered about the ether. A lovely shot from SwittersB, not that the fish is still in the net, the mesh is soft plastic. The photo captures the beauty of the fish and it’s glorious colouration without any handling. To be honest my “check list” for my fishing box, which used to feature such reminders and Lanyard, Water, Rod, Reel, Spare leader, Bandana and Polaroids; now also sports “Camera” and “Spare Camera Battery” added to the spreadsheet. It is tricky not to get caught up with this stuff. There are numerous articles and blog posts on subjects such as “Fishing Photography”, the camera has become a near essential tool, right along with the nippers and forceps and apparently it isn’t enough anymore to simply snap a quick image. Now you need to have the light right, the sun behind you, perhaps some elegantly framed foliage or your uber-expensive serpentine handled bar stock aluminium reel in the frame too. 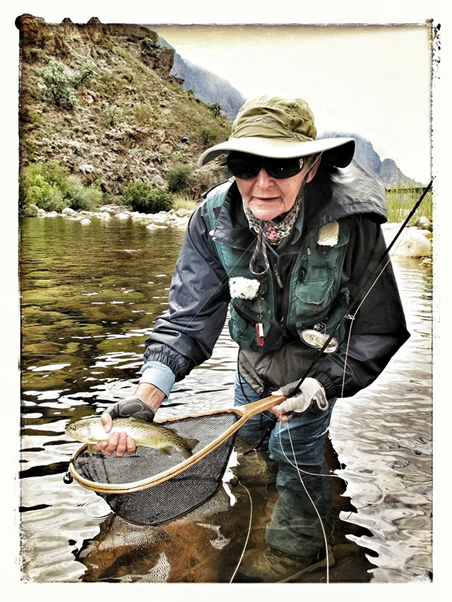 A superb image from Darryl Lampert, who produces some excellent on stream photography. Again note the fish is over the net, the angler’s hands are wet, the fish is horizontal and still partly in the water. It does however cross my mind that this may not all be that good for the fish. Years back I was part of the fight, if you can call it that, to change the management structures of our streams to Catch and Release only. We managed, after some considerable dissention from a few of the older fishing crew, to mandate barbless hooks and no kill limits. The fishing has undoubtedly improved as a consequence and even the old hands who argued that “it wasn’t really fishing if you didn’t have a frying pan” have acknowledged that the system works better and there are more and larger fish to be caught. Another emotive shot from Darryl, capturing the location, the fish and the angler (Denise Hills). Again the fish is over the net to prevent mishap, wet hands and obviously no messing about with the fish out of the water. I personally strongly dislike barbed hooks, they are dreadful things and to my way of thinking have no place on the end of the line of any serious fly angler. They are bad for you, they are bad for hook-ups and most importantly perhaps they are bad for the fish. So we have made things better for the trout in these parts, barbs are out and damage done on hooking a trout is really minimal. Over time we have all taken to using nets with soft knotless bags, all with a view to protecting the fish from harm. Where we would once eschew nets as troublesome accoutrements we now mostly recognise that with fine tippets and small flies, safely releasing the fish is far easier with a net and minimises trauma. You need not play the fish to complete exhaustion if you have a net and you don’t run the risk of dropping the fish at the last minute whist extricating the hook and leave the poor thing with a nose ring. We all now wet our hands, nurse the fish back to strength before letting them go and have been known to dive into the water to retrieve one that seems to be less than recovered. 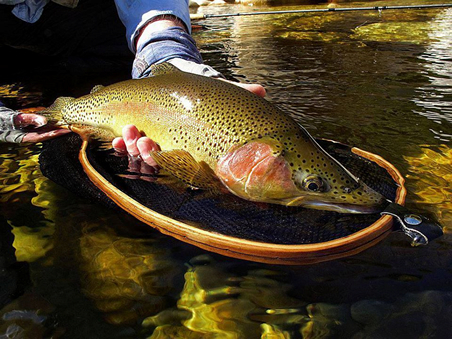 Again, over the net, supported by both hands and water, minimal stress to the fish. 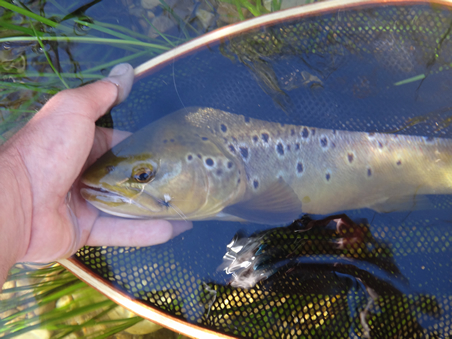 We have, over time come to take greater and greater care of the fish, and I always warn clients that during the moments that there is a fish on the line or in the net my priority is the wellbeing of the trout and that they had better fend for themselves for those few moments in time. But it concerns me that after all these advances and for all the new found respect and care taken of our fish, once the camera is out of the pocket there is a temptation to cave in to craven desire and abuse the trout in an effort to get the perfect image. When fishing with a partner it isn’t quite so troublesome, the angler can look after the fish and the partner can look after the pictures. 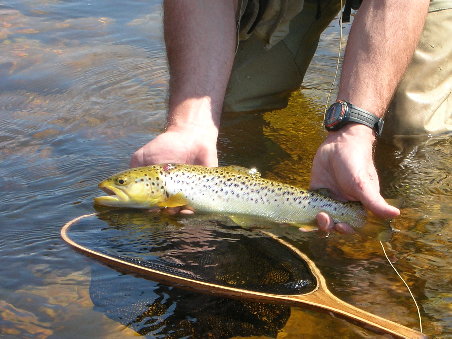 There can still however be a temptation to overdo things and I have seen a number of still and movie images of trout which are undoubtedly being abused for little more than the self-gratification of the angler. I have watched on video some very large trout be hoisted unceremoniously into the air, jaws clamped in a Boga Grip, something that has no place on trout waters as far as I am concerned and more than a few images on line suggest that by the time the light was right, the focus perfect and the backdrop selected the trout had been held captive and stressed for a good deal longer than it need to have been. On one’s own, and to a point, without a witness there is more pressure to preserve your moment for posterity, the photographic thing is then even more problematic. Early last season I took a 21” brown trout whilst angling alone, it was very hard to get a picture at all and sadly the ones that I did capture didn’t really show the true size or magnificence of the trout, but at the same time I wasn’t prepared to overstress the fish just to get the shot, in the end it is an act of dreadfully selfishness to do so. Not a great shot of mine, but on my own I did manage to record the moment without removing the fish from the net and without handling the trout much at all. 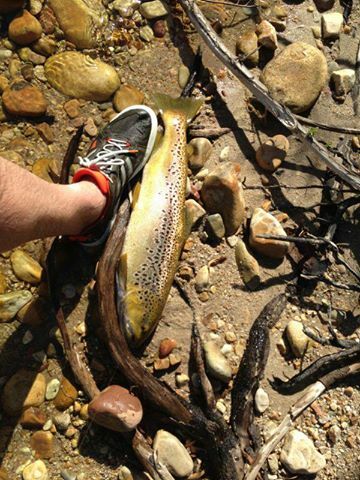 Only recently an image was posted on line of a lovely brown trout, dragged on shore and apparently pinned down with the angler’s foot whilst its picture was taken. I can understand the desire to have a record of such a fish but that should never outweigh the wellbeing of the quarry. Anglers and hunters alike, whether planning to eat or release their targets should feel and demonstrate respect. In this particular photograph the footwear of the photographer would suggest novice status, and here may be some level of mitigation in that, but abuse is abuse and a lack of knowledge isn’t an overriding excuse for such. I have always laughed at the idea that in Germany you need to take an exam before you can go fishing, now I am not so sure that it is such a bad idea, although in fairness in Germany you are not allowed to practise Catch and Release either so maybe it is a poor example. This is NOT how you do it, stress and damage to the fish is virtually assured. One of the great problems with social media is that it is universal, not only do anglers see these images that whizz about the globe faster than bird flu, but so do the detractors of field sports. Bear in mind that whilst you may be keen for your mates to see photographic evidence of your catch so equally it becomes available for the detractors, the gainsayers, the protestors and all the rest who are just dying to find evidence that catch and release fishing should be banned. Indeed in a few countries it already is. I have on occasion posted video of trout fishing and frequently received comments from non-anglers along the lines of “Wow, I can’t believe you take that much care of the fish”. That is nice to know, it puts out a good message to people who don’t understand fly fishing. But equally providing global digital evidence of abuse isn’t good for the cause, that it isn’t good for the fish should already be apparent. Having gone through the evolution that we have, having removed the damaging effects of barbed hooks, knotted nets, dry hands and all the rest of it are we perhaps negating it all in our efforts to record our catches? Is it possible that we are doing more damage now than before the digital age caught up with us? Consideration and respect for our quarry should be a given, I don’t want to be tarred with the same brush as the bass anglers who transport their catches to football stadia so that they can hoist them by the lip in front of a crowd of screaming fans. That we all to some degree traumatise the fish that we catch is probably a given, I like to think that this is no more stressful than being chased by an otter or swooped on by an osprey, but it is incumbent upon us all to minimise any stress, to release the fish as cleanly and quickly as possible and if taking photographs increases the stress we should stop. 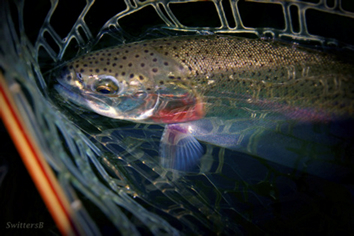 Do not remove the fish from the water (keep it in the net) until you are ready to take the shot. Keep the fish over the net, so that should you drop it there is no additional damage. Wet your hands, it is remarkable how many videos and DVD’s show supposedly experienced anglers failing to take this simple precaution. Use a net with soft mesh and no knots. Personally I prefer to remove the hook after the shot, that way you can prevent dropping the fish and releasing it prematurely when not recovered fully. Limit your time, if you don’t get the shot within a minute or so just give up and let the fish go. Obviously barbless hooks should be used whether you intend to take photos or not. Support the fish’s weight and keep it horizontal, hanging fish by the lip or gills can cause untold damage to vital internal organs. Do not put the fish on dry land, rocks or similar or force the fish to support it’s own body weight in any way. It is wonderful that we now have the opportunity to record our successes, and that we can share those images around the world, but a good shot isn’t worth a life. There is little point in following all the catch and release recommendations only to harm the fish whilst fiddling about with focus and the lens cap.